For the minimal cost of $6, paid every 30 days, you get all of the following . . . Your own personal download page set up for you. Use of the transitional page directing those opting in to click the confirmation email they are initially sent. A series of 7 emails setup in your AIOP back office personalized with your information. These emails not only promote the traffic builders (and the 3 upgrades), but also your AIOP business and Money Machine Dream capture page. Your personalized ebook uploaded to my server and connected to your download page. 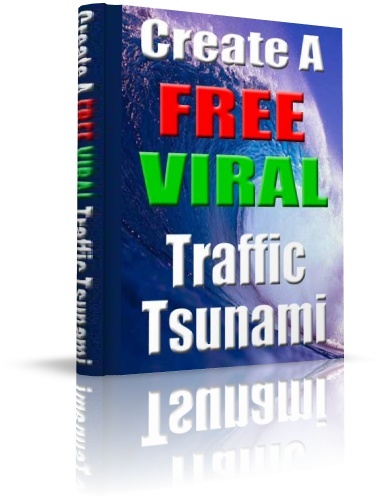 All pieces of the system put together providing you a url (http://ViralTrafficFree.com/yourkeyword) that you can advertise. Here are the benefits to using my system . . .
1 Automatic delivery of your ebook to those responding to the give away offer in the ads you place. 2 The use of a highly effective capture page to get people to want to obtain your free ebook. 3 The building of a list that you can market to at a later time. 4 The automatic promotion of your AIOP business and Money Machine Dream capture page through the autoresponder emails. 5 Having a complete system that makes it easier to advertise and deliver more ebooks that will generate more traffic for you as more people join the traffic builders . . . and generate more cash as many readers of your ebook purchase the inexpensive upgrades to 3 of the traffic programs. 6 The convenience of having the whole system put together for you . . . for those that don't have the time or the skills to create such a system themselves. At only $6 every 30 days, this is a very inexpensive way to give away your ebook to build an AIOP business that, over time, can potentially create thousands of dollars of residual income. If you want me to build you an ebook capture page/automated delivery system, email me at TheMoneyMachineTeam@gmail.com and send me the following information . . .
﻿the keyword or words that you want at the end of your url (for example, http://ViralTrafficFree.com/keyword). The shorter the keyword or phrase is, the better. If you want it real short, your could use your initials or a number. your SignaSource affiliate link and your customized Esignature Money Machine url. I will also need a copy of your rebranded ebook that I can upload to my server. If you are rebranding an ebook for the first time you need to join the traffic builders from the links in the ebook that your sponsor gives you. If I am your sponsor you can go to http://CreateViralTraffic.com/tt-ebook-download to download the latest version of my ebook. If have already joined the traffic builders and have your ids to those programs and you need to rebrand the latest edition of the ebook here is the link to the rebranding page . . . https://app.rebranderpro.com/books/TWCB9RA/rebrand. After I have set up your system, I will send you a "start my subscription" page with an optin form on it. When you leave your full name and email in the form, it will send you out an email with a paypal.me link. When you have clicked that link and paid the $6, I will email you the link to your capture page. Thirty days later you will automatically receive another email with the same $6 paypal.me link to pay for the next month's subscription. You will have 5 days of grace after that email is sent in which to make payment, before your system is taken down. Every 30 days thereafter you will get the email with the paypal.me link, so the subscription is month to month. To stop your subscription, send an email to TheMoneyMachineTeam@gmail.com giving me your name and the word "cancel." ﻿Thank you for the interest in my system.